I log around 1000 highway miles every week for work and drive the rig pretty gently and I work out of it while on the road. Fuel economy of the Eco-Boost is good - depending on the winds; it can range from 16 to 23 (headwind VS tailwind), but would have been 11 to 19 on my last truck. Not a big fan of Sync. The software updates don't seem to impart any improvements in screen responce or some bluetooth connectivity issues. Biggest complaint is the [bumpy road induced] squeaking noise that developed in the cab at around 45,000 miles - MADDENING! I can't locate the source. 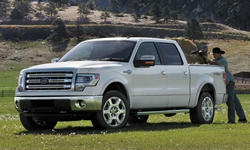 Why the 2013 Ford F-150? Love the looks of the truck. No transmission hump on the rear floor. Makes it very load friendly. Great instrument cluster. Many features available with steering wheel controls. It's a truck - you can't beat the visibility. Even with a heavy duty grill guard installed, fuel economy averages about 18-19. With a tailwind I've seen 22-23 on the highway. 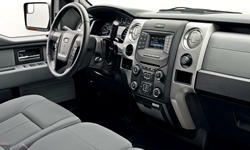 Why Not the 2013 Ford F-150? I get the feeling the Sync system is half-baked. It's intuitive and easy to use, but it's also slow to respond. After the last software update, the nav system displays the posted speed limit on the freeway as 74 (speed limit is 75 in MT). Bluetooth works well, but it's not iPhone friendly. I got a new HTC phone about 6 months ago. It connects reliably, but the Sync ringer selection will not stay where I set it. A squeaking noise in the cab developed around 45,000 miles. I can't locate it and it drives me crazy. The bi-xenon headlights developed a problem at around 30,000 miles. The high beams either wouldn't work or would stay in the high position. It seems to have worked itself out - but I don't have a lot of confidence in them. It's also worth mentioning that while the xenons are great, the difference between the high and low beams isn't very significant. I've been hearing an inconsistent low-speed hum (sounds like you're driving through snow). It goes away after 15-20 mph. Seems to happen most often in -20 to +10 temps. The rear seat clothes hooks barely hold one plastic hanger. The flat load floor of the rear seating area is broken up by the subwoofer near the right rear passenger seat.